Cradle Slate is a company that touts itself as dedicated to producing new ipad / tablet computer bags to help our customer look good carrying these devices. I’m not opposed to looking good when I’m out and about with my iPad (or at least doing my best to have the iPad looking sharp) so I agreed to take a look at their Cradle Slate iPad Bag. Light weight protection. Luxurious Design. Simplicity and function in one very cool package. 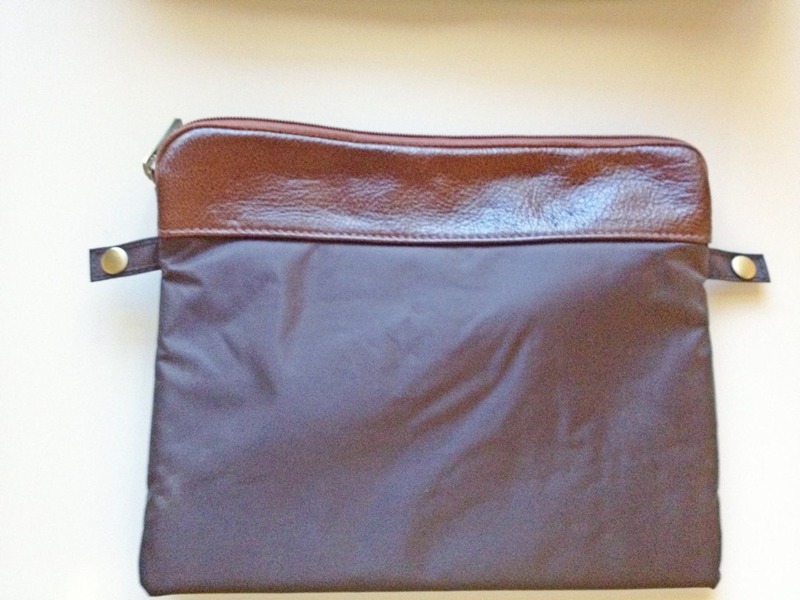 I’ve had mine for several weeks now and as always I’ve got some thoughts to share on what’s to like and what’s not so great about this iPad bag. 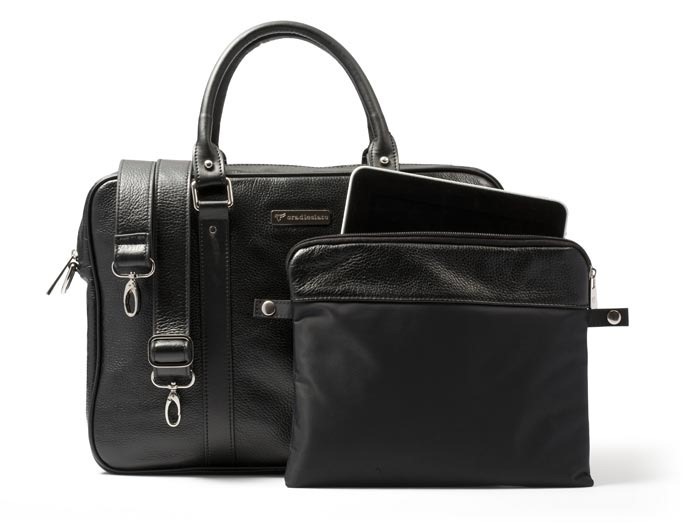 The Cradle Slate iPad Bag is made of soft leather and comes in three colors: Midnight Black Leather, Cowboy Tanned Brown Leather, and Virgin White Leather. I got the Cowboy Tanned Brown version. The bag is designed in two pieces – the main, outer bag and an interior protective sleeve for the iPad. It’s got a 3mm shock-absorbent padding that’s said to provide protection and peace of mind from the daily bumps and bangs that your bag may encounter. The bag is priced at $250. — The leather on this bag is really gorgeous and feels like very high quality. This bag certainly looks very stylish and elegant, living up nicely to that company mission to make tablet owners look good. I was impressed with the look of the bag from the outset, but I fully realized its appeal when my wife tried to mug me the first time she saw it. Ever since then, two days don’t go by without her saying ‘That’s mine right’. 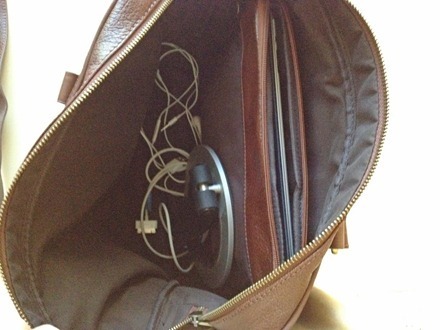 — The shoulder strap is detachable – so you can use it if you want or store it in the bag if you prefer not to use it. — The interior iPad sleeve is also detachable (it has just two easy buttons to attach and detach) and is a very nice standalone iPad sleeve in its own right. 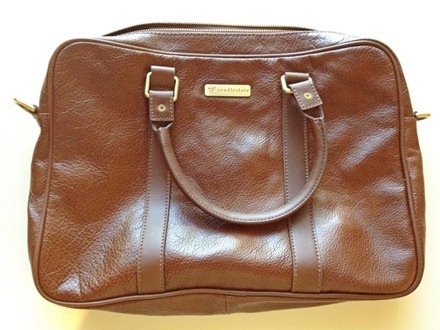 It’s deep brown canvas with a smart leather trim at the top. The outer material on it is water-resistant, it has the shock-absorbent padding, and the inside of it is soft micro-fiber. It fits my new iPad in nicely, even when I keep the Apple Smart Cover on it. — It’s a very spacious bag. It can comfortably hold the iPad, a wireless keyboard, a portable stand or case, a charge cable, headphones, and other bits and bobs. The price tag is steep for an iPad bag, although the quality lives up to the price. 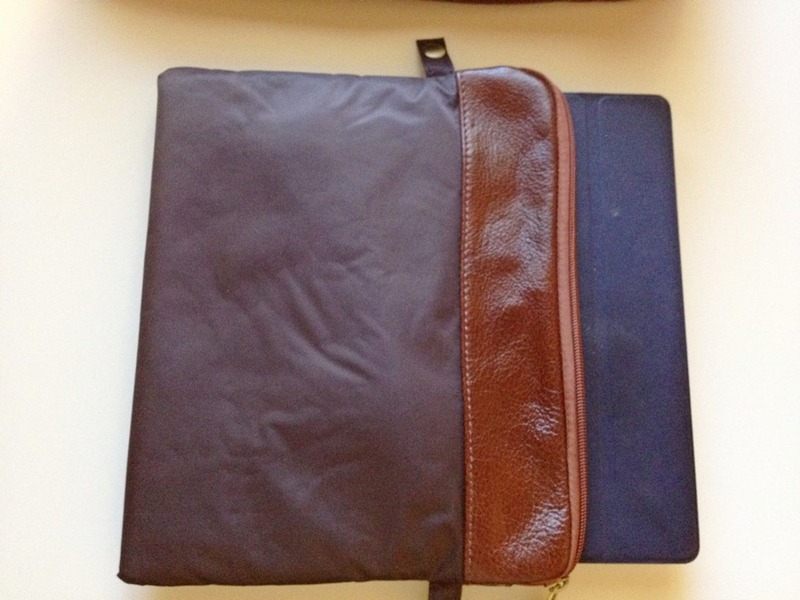 Though it’s not equipped to be a laptop bag, it could serve as a good general purpose bag without the iPad sleeve in it, while the sleeve gets used as a standalone companion for the iPad – so perhaps one could think of it as a bag and an iPad sleeve for the price. Even so, it’s a luxury price. I’ve been trying to think of the best way to phrase this next part – and the best I’ve got is that if you’re a guy this bag may not have you feeling at your most masculine while you’re carrying it. I found that I was asking myself (and my wife, but her answers were filled with ulterior motives) ‘Does this look girly”. Your mileage may vary of course on that feeling – but I will go out on a limb and say the ladies may like the bag a bit more than some guys will. The Cradle Slate iPad Bag is a stylish, versatile bag for the iPad. It offers very high quality to match its price tag and can serve as a good general purpose bag as well. In our household, I can see a situation where my wife gets a lot of use out of the bag for her iPad and more, and I get good use out of the iPad sleeve. 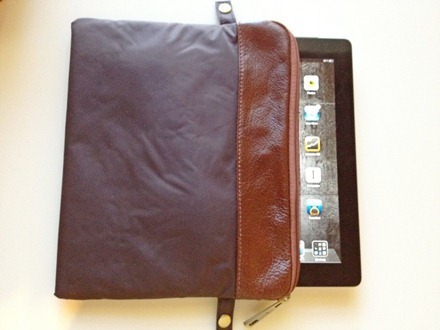 Disclosure: The post author was provided with a review unit of the Cradle Slate iPad Bag by Cradle Slate. For information about our review policies please see our About page.